The Maple Leafs by the Numbers Series continues with the No. 3, and with it, the hardest choice I’ve had to make so far. For the first time in the series, the best player to wear the number is not the player to wear it the longest. That honor would go to Dion Phaneuf, who has worn it for six seasons now. Out of the players, on the list, Jim Morrison was with the Toronto Maple Leafs the longest with seven seasons to his name, but he wore the No. 24 for the first half of his tenure with the team. What made this decision difficult was that the player that was eventually chosen, Marcel Pronovost, didn’t have his best years with the Leafs. There are plenty others, including Phaneuf, who had better years with the Leafs, but Pronovost just ekes it out. Pronovost was playing at College Immaculate Conception Superior School when he was discovered by NHL scouts. He eventually signed with the Detroit Red Wings. That definitely turned out to be the right decision. Coincidentally, he would make his debut with Detroit in 1950 in a playoff series against the Maple Leafs. Pronovost would go on to play the first 15 seasons of his NHL career with the Red Wings. He played a total of 983 games with Detroit, scoring 80 goals and adding 217 assists for 297 points. As for his number, he used No.’s 21 and 23 in his first and 18 in his second season before jumping to No. 3 and wearing that the rest of his career. During his time in Detroit, he would be named to the NHL’s First & Second All-Star Team twice each. He was also in the top five of Norris Trophy voting for four straight seasons from 1957 to 1961. He would also place fifth in voting in 1965, his final season in Detroit. The Red Wings also won four Stanley Cups during Pronovost’s tenure with the team, in 1950, 1952, 1954 and 1955. 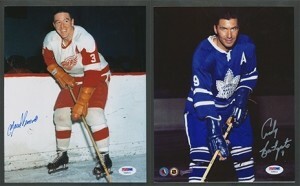 Detroit traded Marcel Pronovost (left) for Toronto’s Andy Bathgate. In 1965, Pronovost would be involved in an eight-player trade that sent him and four other players to Toronto in exchange for Andy Bathgate and two others. He would go on to play the final five seasons of his career with the Leafs. Of course, it was during his tenure with the Leafs in which they won their final, to this date, Stanley Cup in 1967, giving Pronovost his fifth and final Cup win. That season would be the last time he would play in the playoffs. In the 1968-69 season, he would have injurie troubles and only ended up playing 34 games. The next season he would be assigned to the Tulsa Oilers of the Central Hockey League, where he served as a player-coach, and played most of his season there. He would be called up and played seven more games with the Leafs, the final games of his career. He would be inducted into the Hockey Hall of Fame in 1978. After retiring, he returned to the NHL as the head coach of the Buffalo Sabres in 1977, although he would be fired 24 games into his second season with the club. He eventually re-joined the Red Wings as an assistant coach in 1979 and remained there until 1981 before getting fired once again. He would join the New Jersey Devils as a scout in 1990, serving in that position until his death in April of 2015.